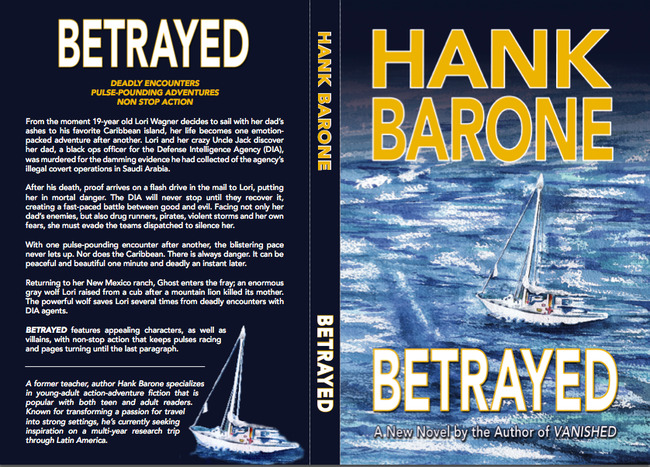 Discover the action-adventure novels of Hank Barone. The story of Zach Malone and Elena de Alba, two brave 15-year-olds united by tragedy, is one action-packed adventure after another. Although the book is categorized as ‘young adult fiction’, I think you’ll find that Hank has concocted an engaging tale that kids, and adults, will enjoy. To read the first two chapters, click here. I know you’ll be hooked! For the past few years Hank has turned his passion and pen to writing great fiction, with two adventure novels completed, and another in the works. Wouldn’t it be fun to help make his first book a bestseller?! Here are a few simple ways you can help make that happen. Share this with everyone you know and ask them to forward it on, as well. You can use the links below to print, e-mail or share this journal posting with your favorite online community. Call your local bookseller and public or school library and request that they order a copy. I can’t wait to bask in the glow of my best-selling-author-husband. Many thanks for your help in turning dream into reality. Better yet, be sure to return and tell us what you think of the book. You can post your comments below or send Hank your thoughts directly.